Mods. Game mods mean a lot of different things to different people. For some, mods mean rich total conversions that redefine what the entire game is about, sometimes to the point where the original is nothing more than a vehicle or husk to house the mod. To some a mod is the ultimate ability to be able to configure and tweak the game to fit their exact fancies, likes and expectations. To some mods are a way to breathe new life into a game through new maps, new enemies or new crazy game modes and difficulties. To others mods simply are a solution to getting all those small quality of life improvements that the developers either don't realize or don't prioritize. There are many other reasons to make and play mods. Mods serve a multitude of different purposes but all boil down to allowing creative and driven players to be able to share their creations with a wider audience of players with different needs and wants. To give players power to not only play the game but to affect it and be a part of its creation and evolution. Fatshark has always wanted to add mod support for it's games. It's been on feature lists since Lead and Gold first hit Steam in the late 00s. Somehow it's one of those things that when push comes to shove, when the hard calls at the end of the project have to be made, when the absolute non-essential planned features end up on the cutting block to get the game out on time (or fashionably late *cough*) modding has always gotten cut. Even for Vermintide 1, mod support was there in the early days but soon lost out to more "important" features. Ironically, it was the Vermintide community that showed the way and through DLL hacks and lua injectors managed to mod the game in spite of our best efforts. With mods and mod packs like the Vermintide Mod Framework, the QoL (Quality of Life) mod pack and even Fashion Patrols, Vermintide got a new and budding modding community. Shown the way by the community, Fatshark's CEO Martin Wahlund and Technical Director Robin Hagblom yet again discussed modding and how to get modding into Fatshark's next and upcoming (and yet unannounced) game Vermintide 2. 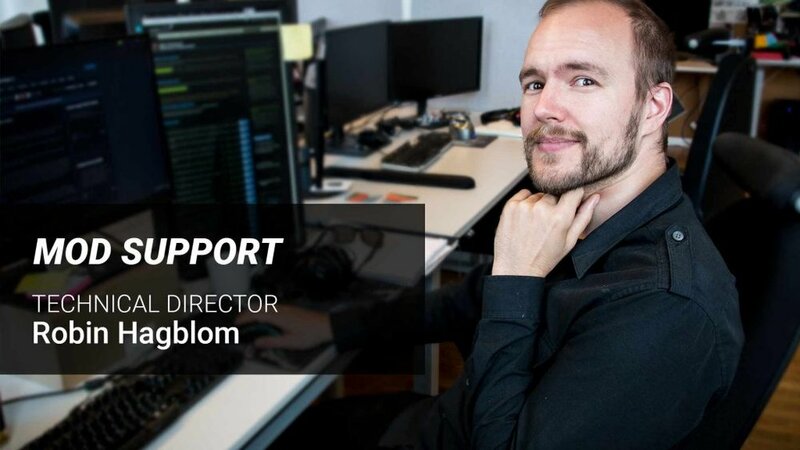 It was decided that Robin would work on mod support in addition to his other responsibilities with the goals of using Vermintide 1 as a sandbox and Vermintide 2 as the end goal for better mod support and Steam Workshop integration. Being able to easily find, rate, share and discuss mods is important to have a living community and Steam Workshop provides just this. To be able to find and install mods, you simply open the Workshop tab from the game's Steam Hub and subscribe to the mods you want to test; Steam will make sure to download them before booting up the game. When subscribing, the workshop will also tell you if there are any other mods you need to get that mod working as Mod creators are able to set up re-usable components that can be re-used for a number of mods. One such mod component is the Verminitide Mod Framework (or VMF for short), which is a community built framework of pre-built mod components that greatly lowers the threshold of mod creation. In the Workshop you also have the means to up vote the mods you like as well as feedback the mod creator through the discussion threads each mod has. These are valuable tools to be able to affect the direction mod creation takes even if you don't create mods yourself. The workshop also allows anybody to create mod packs, where you bundle a number of mods into a set package, maybe add some glue yourself to make them work better together and then post on the Workshop. A lot of the early Vermintide mods straddled the line between QoL improvements and outright cheats; often providing both. With as many threads praising and recommending mods in the Vermintide Steam forum there were threads of frustration against cheaters and modders ruining their games or giving them unfair advantages. Many threads on the subject inadvertently turned into battlefields with those positive to mods on one side and those who felt modders and cheaters invading their games an disrupting on the other. Through this strife the first steps were taken, modders started making cheat free versions of their mod packs, rudimentary anti-cheat mods as defence against the cheats of other mod packs and Fatshark started getting in touch with the modding community to explore what could be done to reap the benefits of modding and at the same time avoid the pitfalls and conflicts. By using third party anti-cheat to secure Vermintide 2 against hacks and cheats, plans started to take form how to combine this and still leverage the awesome creativity of the Vermintide community without fanning the flames of the previous conflict. The path forward was now clear. To be able to keep vanilla players from getting involuntarily invaded by game altering mods and to to ensure nobody will think you've cheated when you sport the cool flair you've gained through in game achievements the game now is split into an Official Realm and a Modded Realm. The Official Realm is just the game as it's been since release while the Modded Realm is a sandbox for Mods and experimentation. In the Modded Realm you can do whatever you want, install mods that allow you to equip every possible item, play total conversion mods, cheat if that's how you want to play. The main difference is that in the Modded Realm normal progress is disabled. You will have access to all your gear, levels and abilities from the Official Realm, but as long as you're playing there XP, Loot drops and Challenges are disabled. If you want to try out stuff you don't have yet, you'll have to install mods for it. So, what about Quality of Life mods? Isn't being able to play the game with the latest Quality of Life improvement mods half the point to having modding? I still want loot and XP! Well, that's why we have a concept of Sanctioned Mods. Sanctioned Mods are essentially mods that have been sanctioned by Fatshark for use in the Official Realm. Exactly where this goes only time will tell as it is uncharted territory both for us and for the modding community. The idea is to be able to vet mods that provide Quality of Life improvements, UI tweaks, Visual effects and other mods that don't give a considerable advantage to players or alter the gameplay for other players a way to be used in the Official Realm with full progression. The process to get a mod vetted for Sanctioned status will be to get the mod creator to petition for sanctioned status in the Steam forum for the Vermintide 2 SDK, after that Fatshark will review it that it does not contain any cheats or break the rules above and if everything checks out, it will be updated to be able to be run in the Official Realm. Depending on how many mods apply we will likely have to revise and evolve the process over time to best fit the needs of modders without having a negative impact on Fatshark's other support of the game. If there are too many to handle, using the Workshop's built in up vote system might be a way forward, but only time will tell. Currently the Vermintide 2 SDK which is used to create mods is in its early days. Still being only alpha, most mods today are Lua code mods, UI mods or minor graphical tweaks as these are the things the easiest to change in the current state. In the near future, we will also provide a data dump that will be updated along with the game to provide that source assets that were used to create Vermintide 2. This will make it easier for modders to figure out how the different parts of the game link together and to change things at a deeper level. Without proper tools and exporters though, things like making new maps or adding new models are likely still out of reach for all but the most dedicated modders. This is why this is our next step, as soon as the source data dump is out in the wild our next objective is to work towards getting a full tool chain out. We don't have any real ETAs for this yet as it's very much uncharted territory for us, but making custom maps a possibility is very high on our priority list even though it's likely one of the most challenging hurdles to overcome. Besides this long term goal we also, before then plan to ship an update with quality of life fixes and improvements based on the feedback we get on the SDK and mod systems. When this ships will depend on how much needs to be fixed, but sooner rather than later is our goal. Want to make a mod, want more info or just get in touch with the modding community? For more general info check out the Mod support 'How to Guide'. There's a Modding sub-forum in the Vermintide 2 Steam forums for mod related discussions. There's also a community driven modder discord, Vermintide Modders, which can be accessed with the following link. It's very welcoming and (at the time of writing) probably the easiest place to get into contact with other modders. You can download the Warhammer: Vermintide 2 SDK which can be found under the Tools section of your Steam library as long as you own Vermintide 2.